Russian pagan folk metallers Грай (Grai) from Naberezhnye Chelny, Tatarstan will soon release their new full-length album, entitled “Млада – Mlada“. The band was formed in 2005 as Raven Blood, then changed to Ворог and finally to Грай in 2007. Their debut full-length “Полынь-Трава” was out in 2009 via Volh Records. Their second album “О Земле Родной” was released via SoundAge Records in 2011. Both these albums were later re-released via the Dutch label Vic Records for distribution outside Russia. In 2014 the band signed to the German label Noizgate Records that will release their third album on October 3rd 2014. Грай is one characteristic example of Russian folk pagan metal, since their music covers a very wide range of this genre. They already revealed a huge improvement between the first 2 works and this album comes as the natural evolution of the band. Грай have perfected their sound with a really professional crystal clear production. “Mlada” includes 9 songs plus 2 bonus tracks, with a total duration a little over 46 minutes. The band has a really versatile sound, with great orchestrations, technical play and wonderful vocals. Rooted in the typical Slavic folk metal, they have influences from Russian folk rock, acoustic folk and extreme pagan metal, combining everything in a very solid and balanced sound. Their metal instruments have a quite heavy sound when needed, with really powerful guitar riffs and bass lines. Грай use several traditional instruments in this album, like flutes, bagpipes, kalyuka, recorder, jew’s harp and violins, proving to be quite skilful and technical folk musicians! They don’t play these instruments just to enrich their sound, but they have a very active role in the compositions, carrying often the lead melodies, adding a unique folk touch to their music. Vocals remain at the high level of the previous albums, where their two lead female singers define the band’s sound with their beautiful and variable voices, ranging from folk metal to more aethereal or pure Slavic folk style. The brutal death metal growls are still in the mix, mostly in the beginning though and they disappear as the album evolves… And while their vocals are one of their trademarks, at the same time there are many instrumental passages and some totally acoustic folk interludes in the compositions. Their music has an overall joyful playful folk mood, with only few darker melancholic parts. All lyrics are sang in Russian, dealing with fairy-tale themes and local folklore, totally fitting to the atmosphere of their music. If you liked their previous works, you better check out this album too, since Грай have clearly improved their sound, remaining faithful to their music roots. 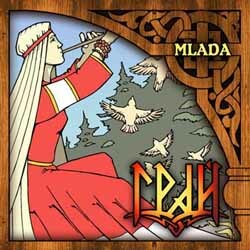 “Mlada” is a very technical album, where pagan folk metal meets instrumental progressive folk rock in a really interesting and balanced mix. It will be released in a luxurious 6-panel digipak edition CD via Noizgate Records, with a 12-page booklet including all lyrics translated in English. Additionally the CD includes a 24X48cm folded poster, with photo of the band on one side and the original Russian lyrics on the other. The wonderful album illustrations are by Andrey Andreev. You better visit the official pages of the band below for more details and sound samples. I loved their first 2 albums. Very much looking forward to this one.